Optimal Data — Crud. Photography seems like a nice clean, simple hobby or profession. Yet, as any photographer can tell you, we deal with crud all the time, and in many forms. Article on dslrbodies.com. Nikon Capture NX-D 1.1.0. Nikon today released version 1.1.0 of Capture NX-D, both a feature addition and bug fix release. Article on dslrbodies.com. Olympus 12-40mm f/2.8 Pro Lens Review. The Olympus 12-40mm f/2.8 was the first of its Pro lineup of lenses, eventually going to be a set of four (7-14mm f/2.8, 12-40mm f/2.8, 40-150mm f/2.8, 300mm f/4). Article on sansmirror.com. Selling Images is Like Selling Cameras. Selling images these days is tough. Really tough. Two things have happened in the selling of images that mimic what happened in the selling of cameras. Article on dslrbodies.com. Sports Illustrated Lets Remaining Photographers Go. Sports Illustrated (SI) magazine on Thursday laid off their remaining six staff photographers. Article on dslrbodies.com. Returning a Nikon D750 for Repair? NikonUSA provides a shipping label to return your D750 back to them to have the banded flare problem addressed. However, that UPS shipping does not include insurance. Article on dslrbodies.com. Samsung Updates NX1 Firmware. Samsung issued firmware version 1.2 for the recent NX1 camera, and the list of changes are quite substantial. Article on sansmirror.com. Tamron 15-30mm f/2.8 now priced (US$1199) and available for preorder. Nikon updated ViewNX to 2.10.3 and Picture Control Utility 2.0.2 to support the D5500. Did “Good Enough” Win? The “good enough” problem is really eating away at the camera companies now. I think it’s going to be extremely important for them to understand whether the “good enough” versus “best possible” market splits are 80/20, 90/10, 95/5, 99/1, or worse. Article on dslrbodies.com. Nikon Issues D750 Service Advisory. Nikon today issued their formal service advisory for the banded flare problem on D750 cameras. Article on dslrbodies.com. A Word About CP+. The CP+ trade show in Japan begins almost exactly three weeks from today (February 12th), and it’s generally a time where every camera maker shows off its latest and greatest. Article on dslrbodies.com. The State of Cameras, 2015. So how’s the camera industry doing satisfying users these days? Article on dslrbodies.com. Panasonic GF7 Aims at Selfies, Too. You’re so vain. At least that’s what the camera makers have decided. All that smartphone selfie action has now resulted every camera maker trying to come up with their 180° LCD swivel so that they, too, can get you selfie-ized. Article on sansmirror.com. Database page for GF7. Nikon AW1 Review. It’s a little surprising that it took so long for Nikon to return directly to the ILC underwater world (though not diving cameras, per se). Most divers long ago just succumbed to underwater housings for their regular digital camera. Review on sansmirror.com. Rationalizing Zoom Lens Sets. Consider the trio of must-have FX lenses: 14-24mm, 24-70mm, 70-200mm. Obviously, you can stand at one spot and shoot at any focal length from 14mm to 200mm with that trio. Article on dslrbodies.com. Nikon Still Playing Dr. Jekyll and Mr. Hyde Yes, Nikon has been quicker to deal with the D810 white dot and D750 banded flare problems than they were with the D600 and D800 issues. But it seems that they still are trying to stay under the radar whenever possible. Article on dslrbodies.com. December/January Software Updates. Article on dslrbodies.com. What Did I Miss? One of the things I use the year-end holidays to do is to reflect backwards and project forwards. I don’t do this just with cameras, but with pretty much all things that interest me, including my modest stock portfolio ;~). Article on dslrbodies.com. How Internet News Distorts Things. dpreview today published an interview with Samsung executives about the NX1. Their title for the piece was “CES 2015 Samsung Interview: Mirrorless to Outsell DSLRs ‘in three years’”. Article on sansmirror.com. People Who Buy Lenses are Different... …than people that don’t. The interchangeable lens camera market has a very split personality. Article on dslrbodies.com. Samyang Introduces 135mm f/2 Manual Focus Lens. Nikon F-mount data page. Mirrorless mounts data page. Aha! Quality versus Size. 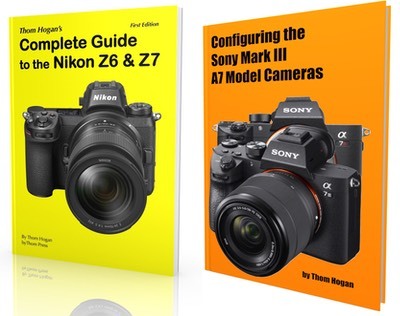 Every now and again I get an email or message from someone that helps me understand or make clearer what the real target of camera makers should be. Article on dslrbodies.com. Camera Prices. Just for the heck of it, I decided to do a quick survey of pricing on a number of much talked about and popular interchangeable lens camera bodies and then place it in descending order of price. Article on dslrbodies.com. Did You Get the Bargain of the Year? It’s still lurking at a decent price (US$520 with optical finder, US$485 without), but a few managed to get a full Coolpix A set for about US$400 during the Christmas rush/closeout. Article on dslrbodies.com. Nikon Again Acknowledges D750 Issue. In a short knowledge base item posted yesterday, Nikon updated their statement about the D750 banded flare problem. Article on dslrbodies.com. The Good News, Bad News Mirrorless Problem. I’ve written before about how the mirrorless camera makers are playing catch up. Article on sansmirror.com. Firmware Updates on Parade. A couple of firmware updates appeared in the mirrorless world this week. Article on sansmirror.com. The D810 announcement in mid-2014 was a bit of a surprise. Why? Because previous to the D810, Nikon hadn’t really ever done a true incremental update on a small FX body. Review on dslrbodies.com. Lens Mount Gravity. In the film world we had an array of lens mounts that became large enough to consider as being widespread… Article on dslrbodies.com. Are DSLRs Still Relevant? Seems like every day recently I’ve been pointed to another “I’ve switched to mirrorless…” article somewhere. Meanwhile, DSLR sales are still on the slide while mirrorless sales are basically flat year-to-year. Article on dslrbodies.com. Panasonic LX-100 Review. The Lumix LX-100 is Panasonic’s compact camera for the serious photographer, and the latest in a long line of LX bodies that cater to the enthusiast, and maybe even professional. Article on gearophile.com. Some Current m4/3 Impressions. Over Christmas I decided to challenge my m4/3 gear: I took only m4/3 cameras and lenses to Costa Rica for a short wildlife-oriented trip. Article and photos on sansmirror.com. Nikon Announces D5500 and 300mm f/4 Update. As expected, Nikon introduced the latest generation of the D5xxx line of cameras at CES. Article on dslrbodies. D5500 data page. 55-200mm II data page. 300mm f/4E data page. Sigma Sneaks New Teleconverters Out. Over the holidays Sigma announced new teleconverters. Article on dslrbodies.com. Fujifilm Announces 16-55mm f/2.8 Lens. Fujifilm today announced the expected 16-55mm f/2.8 lens for the X mount. This fast mid-range zoom (approximately 24-85mm equivalent) slots nicely alongside the previously released 50-140mm f/2.8, giving the Fujifilm X series cameras two pro-caliber lenses to cover the 24-200mm focal range with that f/2.8 aperture. Article on sansmirror.com. Lens data page. Olympus 40-150mm f/2.8 Lens Review. Thom’s review of the Olympus 40-150mm f/2.8 Pro lens for m4/3 cameras. Article on sansmirror.com. New Year Resolutions. Here’s a slightly tongue-in-cheek version of my advice to the camera companies for the coming year, along with a Naughty or Nice label for how each company did this past year. Article on dslrbodies.com. Difference Between “A” and “Fundamental” Problems. There is a difference in the level of camera problems. Article on dslrbodies.com. QA Sooner or Later. Nikon has recently been tripped up by what I’d regard as a series of QA (quality assurance) failures: not catching things that should be dealt with before products get to customers. Article on dslrbodies.com. The Good News and Bad News. With Nikon now acknowledging a flare issue with the D750, we have four major FX DSLR bodies in a row from them that have had problems that really should have been caught before leaving the factory. Article on dslrbodies.com. Nikon Issues Statement on D750 Flare. Nikon today issued a statement about the so-called flare issue of the D750. This problem shows itself as a dark bar across the top of an image where backlight is present, though it apparently is very angle dependent. Article on dslrbodies.com.